The survival rate of films made before 1950 is at such a low percentage that any effort to locate and restore our cinematic heritage is commendable. Thus, the new three-disc DVD set from Flicker Alley, Saved From The Flames, which gathers 54 rare and restored films made from 1896-1944, is already one of the most important home-video releases of the year. The title refers to the flammable nitrate film that, when left unattended, can literally wither to dust. The flammable aspect stems from nitrate’s having a similar chemical composition to gunpowder. The films in this set were spared this fate by such saviours as Serge Bromberg’s Lobster Films and David Shepard’s Blackhawk Films. The set comes with an annotated booklet that not only discusses each of the 54 movies contained in this collection, it also indicates just how the footage was located and subsequently restored. 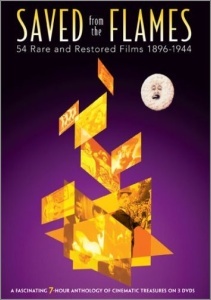 The myriad of films collected over the three discs includes some of the most primitive moving-picture efforts, early experiments with colour and special effects (including Clément Maurice’s 1900 French film, Cyrano de Bergerac, which has both colour and sound), footage of actual historical events, comedy shorts and animated cartoons, musicals, advertisements, news coverage and some of the first examples of narrative films. The result is a fascinating look at a variety of filmmaking styles from throughout the world and over a period of several decades. One of the many highlights in this package is a 1922 comedy entitled The Pest (Gilbert M. ‘Broncho Billy’ Anderson), in which Stan Laurel appears without partner Oliver Hardy, with whom he would be teamed in another five years. The long flight of steps that would be featured prominently in the duo’s lost 1927 silent, Hats Off (Hal Yates), and their quintessential 1932 Oscar-winner, The Music Box (James Parrott), make a significant appearance in this early Laurel short as well. The set also includes some terribly rare footage of Stan and Oliver together in a rare movie press ad announcing upcoming releases. Found in France (and, thus, dubbed in French), this remarkable footage was discovered among the effects of a shoe-factory owner who had acquired roughly 300 reels of films to be rendered into glue. Other discoveries contained in this set include the Lumière Brothers’ Partie de cartes (Card Party, Leopoldo Fregoli, 1896), one of the first moving pictures ever to be projected publicly, which was found in the mid-1980s in a French cheese store; the 1901 Georges Méliès fantasy Excelsior!, discovered in a large trunk of films purchased from an antique dealer; and a rare sound film recording from 1927 featuring Charles Lindbergh’s take-off on his transatlantic flight from New York to Paris that had been misfiled at the Fox studios and considered lost until 1973. From the Blackhawk and Lobster Films archives, the set manages to also offer such gems as Segundo de Chomón’s Excursion dans la lune (Excursion to the Moon, 1908), which imitates Méliès’ noted Le Voyage dans la lune (A Trip to the Moon, 1902), complete with colour-stencil footage; Mack Sennett’s frantically funny 1924 comedy, Lizzies of the Field, directed by car-chase master Del Lord; and The Monkey Race (1909), a film produced in Italy that influenced Sennett’s later methods (and is the portent to every chase scene in more modern films from William Freidkin’s The French Connection, 1971, to Hal Needham’s Smokey and the Bandit, 1977). The set’s accompanying booklet includes an interesting anecdote regarding the discovery of The Monkey Race. A collector who hoarded nitrate films in his apartment and would project them for friends, using projectors with high heat arc lamps, owned the original film. The verdict was that the archivist who bought the films for preservation likely saved him and his neighbors from incineration. Much of the material contained on this disc has critical as well as historical significance. Balloon Land, the 1935 Ub Iwerks cartoon, is amazing in its fluidity of movement and use of colour and background art. Max and David Fleischer’s combination of live action and animation in Cartoon Factory (1924) inspired Disney’s Alice series and all subsequent attempts to blend real people with cartoon images. Émile Cohl’s Fantasmagorie (1908) creates animation through stop-motion photography in what may be the first animated cartoon to do so. The film footage contained herein has important historical, cultural and critical value, while the set’s crazy-quilt categorizing of the entries allows us to see how each short places within cinema’s evolutionary process. The fact that the three-disc set manages to compile so many films of such value makes Saved From The Flames an essential addition to any library or collection.